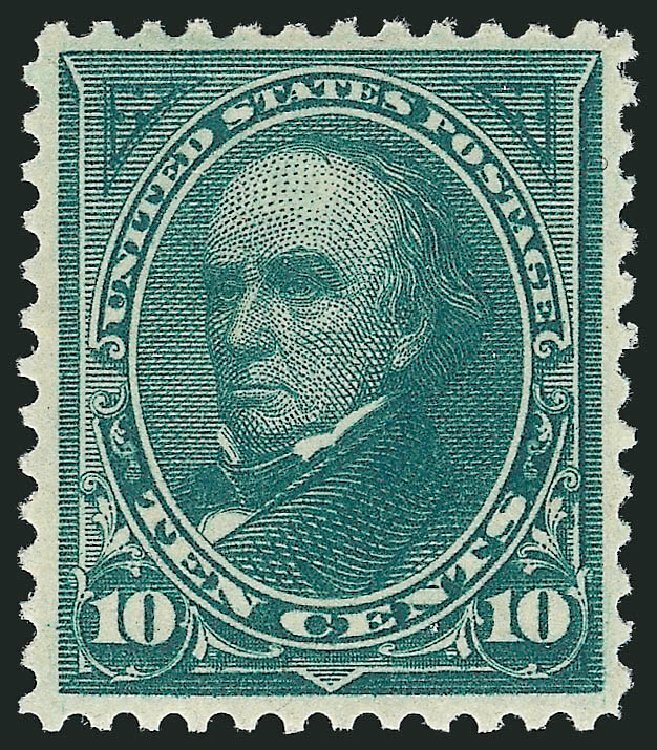 1894, 10¢ dark green, imperf. 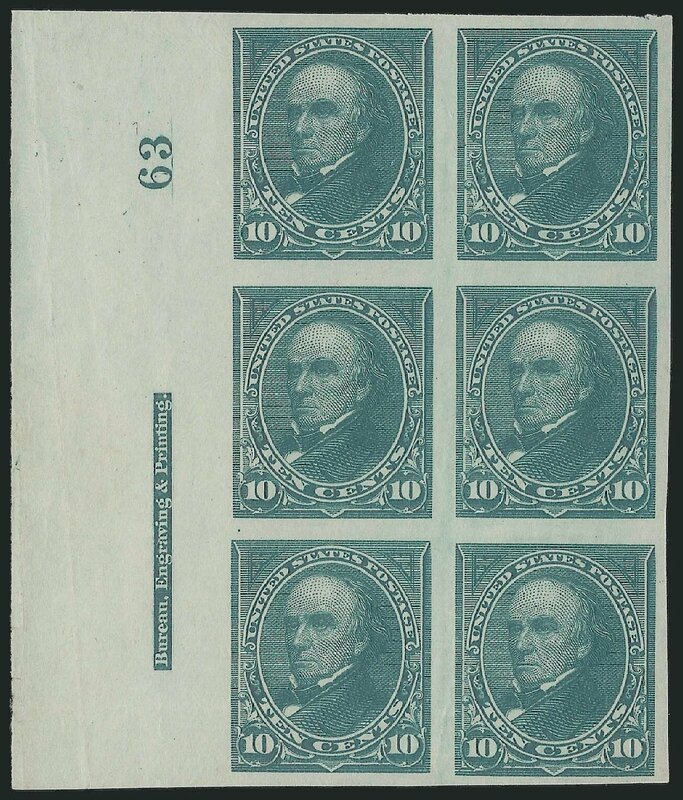 Horizontal pair, full o.g., ample to large margin, deep color, Very Fine (formerly Scott 258a & 258Pa). Scott No. 258P5; $500. 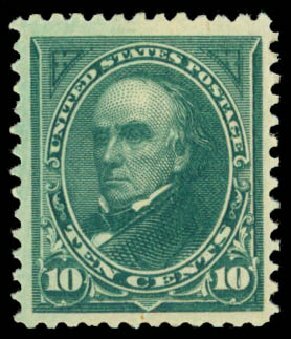 1894, 10¢ dark green (Scott 258), o.g., never hinged, very elusive stamp when found in immaculate mint condition, with sterling color and sharp detailed impression, Fine. Scott $850. Estimate price $250 – 350. 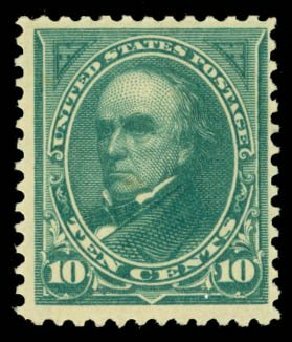 1894, 10¢ dark green (Scott 258), o.g., lightly hinged, impressive example of this tough stamp, with unusually large margins and great color, Very Fine to Extremely Fine. Scott $275. Estimate $250 – 350. 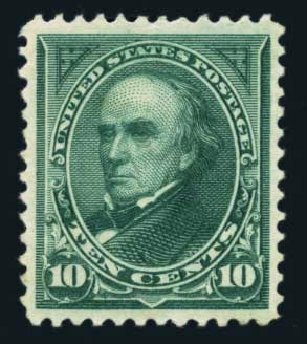 USA (Scott 258) 1894 WEBSTER 10? 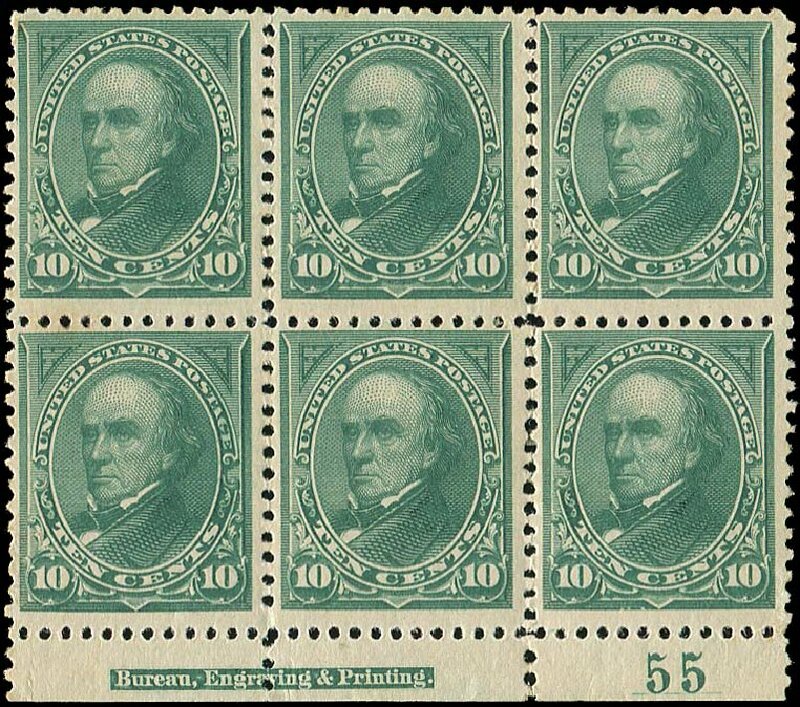 DARK GREEN (BOTTOM PLATE) Bottom plate and imprint block of 6 (plate #55). Fresh, fine to very fine, original gum, previously hinged. Cat $3250. 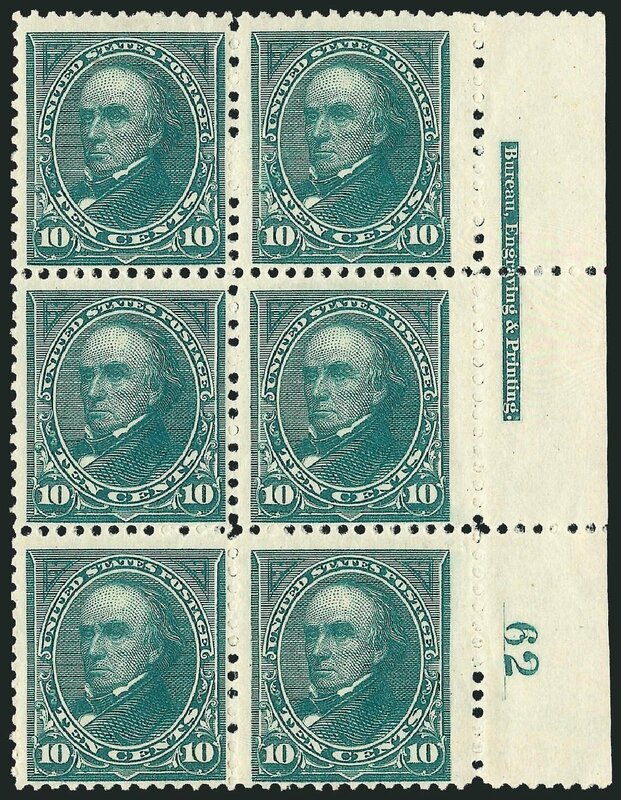 USA (Scott 258) 1895 WEBSTER 10? DARK GREEN Pretty used example, rich color, large margins, extremely fine. Cat value $22. 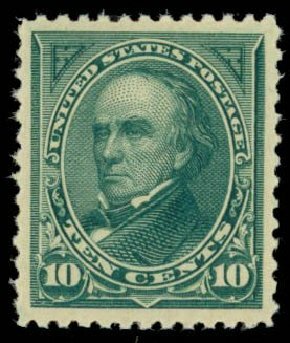 1894, 10¢ dark green (Scott 258), o.g., previously hinged, an outstanding GEM quality example of this terribly difficult stamp, that is rarely found well centered with such large margins, a great stamp with iridescent color, Extremely Fine to Superb, 2014 P.F. certificate. 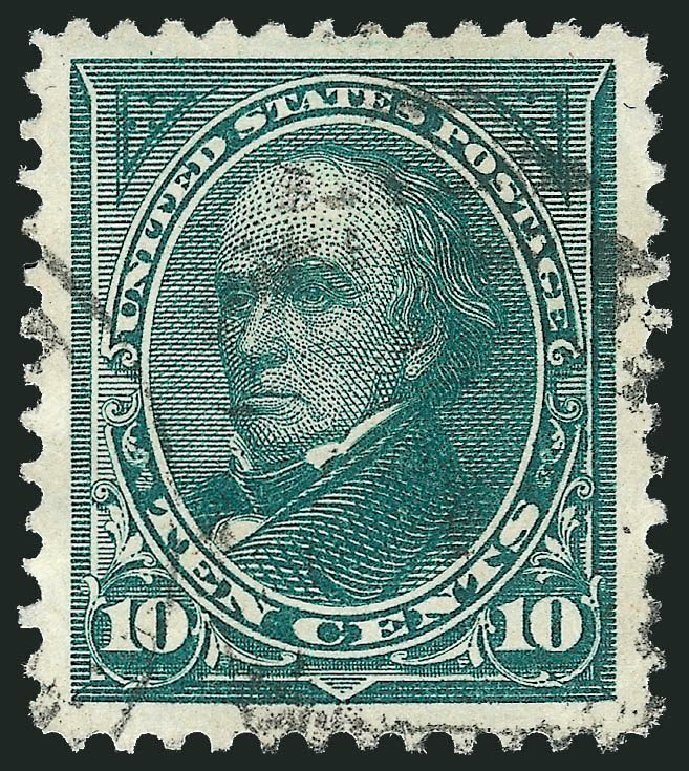 Scott $300. Estimate $500 – 750. 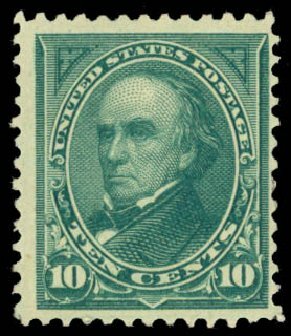 U.S. General Issues, 1894, 10¢ Dark Green, #258, l.h., “tiny thin”, very well centered, lovely Extremely Fine appearance, PSAG (2014) cert. 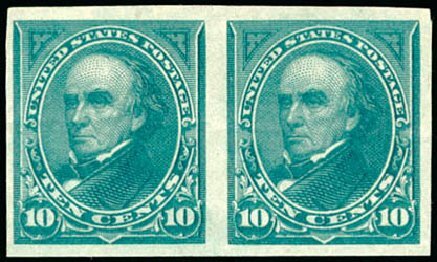 Scott $300. Estimate price $100-120. 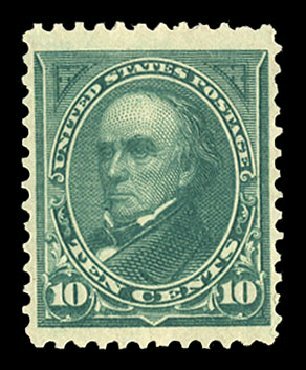 1894, 10¢ dark green (Scott 258), o.g., hinged twice, extremely desirable example of this notoriously difficult stamp, with choice centering and brilliant color, Very Fine, 2004 P.F. certificate. 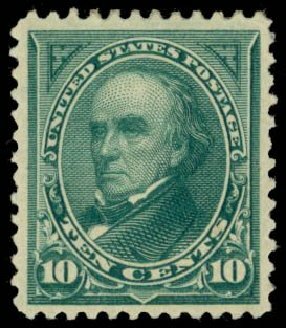 Scott $300. Estimate value $300 – 400. 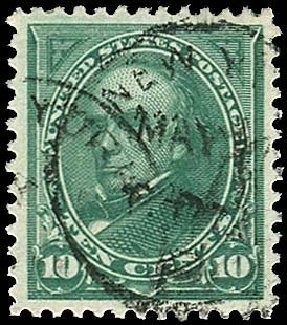 1894, 10¢ dark green (Scott 258), o.g., never hinged, remarkably fresh with bright color, Fine to Very Fine. 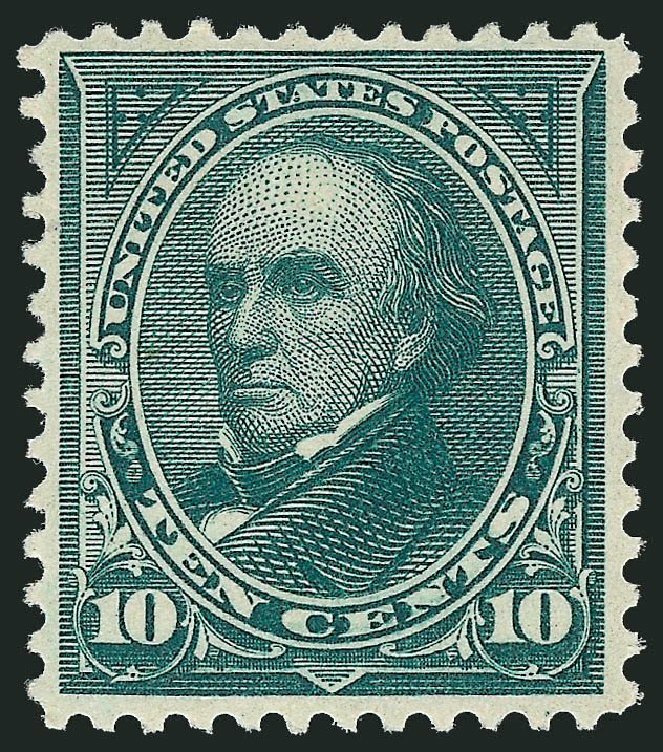 Scott $900. Estimate $350 – 500.